A concert harp with a modern twist. The pillar has an elegant, stylish, smooth shape and is embellished with graceful spiral flutes. The Salisbury incorporates all the essential features found in the Canterbury. Both harps harness modern technology with traditional techniques and craftsmanship. The main constructional glue we use has titanic strength (it’s the same glue used in the London Eye). The Salisbury, like the Canterbury, is famed for the stability of its tuning. Uniquely, the soundbox ribs we use are cast from bell metal. Carbon fibre is carefully used in the key areas to ensure great strength and reliability, yet intense responsiveness. The gold-plated mechanism contains almost 2,000 internal moving parts; precision engineering ensures it is built to be accurate, reliable and fully adjustable. "This harp is the reason I opened PoppyHarp. It is a stunning harp, with beautiful earthy tones that has only become more and more beautiful each year I have played it. 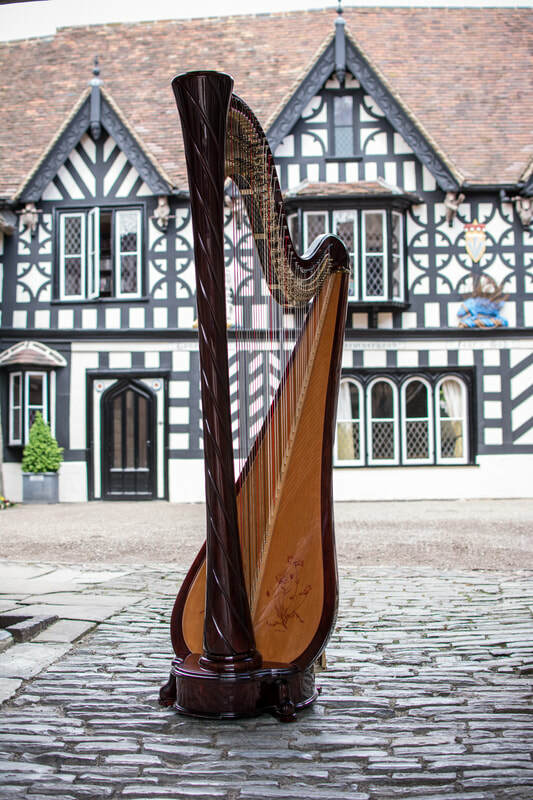 It is truly a hidden gem in the harp world."